Robotic technology is quietly transforming the world of agriculture. In this article, we describe how this market will plausibly grow to become a $45Bn industry by 2038. We will also demonstrate how diverse this emerging industry is in terms of forms, functions and fortunes. For further information please refer to our report Agricultural Robots and Drones 2018-2038: Technologies, Markets, Players. This report develops a detailed roadmap of how robotic technology will enter into different aspects of agriculture and how it will change the way farming is done. 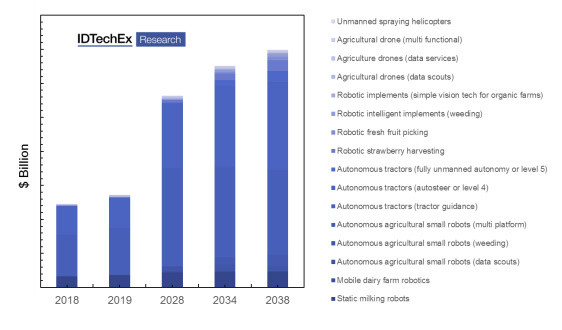 It will provide 20-year forecasts for 16 categories including static milking robots, mobile dairy farm robotics, autonomous agricultural small robots (data scouts, weeding and multi-platform), autonomous tractors (simple guidance, autosteer, fully unmanned autonomy), robotic implements (simple and highly intelligent), robotic strawberry harvesting, robotic fresh fruit picking, and agricultural drones (data scouts, data services/analytics, multi-functional drones, unmanned spraying helicopters). Unmanned autonomous tractors have also been technologically demonstrated with large-scale market introduction largely delayed - not by technical issues but by regulation, high sensor costs and the lack of farmers' trust. This will start to slowly change from 2024 onwards. The sales will however only slowly grow. We estimate that around 40k unmanned fully-autonomous (level 5) tractors will be sold in 2038. The take up will remain slow as users will only slowly become convinced that transitioning from level 4 to level 5 autonomy is value for money. This process will be helped by the rapidly falling price of the automaton suite. These robots also appear like strange creatures at first: they are small, slow, and lightweight. They therefore are less productive on a per unit basis than traditional vehicles. The key to success however lies in fleet operation. This is because the absence of a driver per vehicle enables remote fleet operation. Our model suggests that there is a very achievable operator-to-fleet-size ratio at which such agrobots become commercially attractive in the medium term. We are currently at the beginning of the beginning. Indeed, most examples of such robots are only in the prototypes or early stage commercial trial phase. These robots however are now being trailed in larger numbers by major companies whilst smaller companies are making very modest sales. The infection point, our models suggest, will arrive in 2024 onwards. At this point, sales will rapidly grow. These small agrobot fleets themselves will also grow in capability, evolving from data acquisition to weeding to offering multiple functionalities. Overall, we anticipate a market as large as $900M and $2.5Bn by 2028 and 2038, respectively. This will become a significant business but even it will remain a small subset of the overall agricultural vehicle industry. We forecast that commercial sales- either as equipment sales or service provision- will slowly commence from 2024 and that an infection point will arrive around 2028. Our model suggests a market value for $500M per year for fresh fruit picking in orchards. For more see www.IDTechEx.com/agri and find out more about IDTechEx at www.IDTechEx.com.